Don Fraser, a former Peanuts master licensee for more than 35 years, and co-founder of Aviva Enterprises and founder of Inetics, Inc., and Derrick Bang, author of 50 Years of Happiness: A Tribute to Charles M. Schulz and Charles M. Schulz: Li'l Beginnings, have completed their tribute to Sparky Schulz. 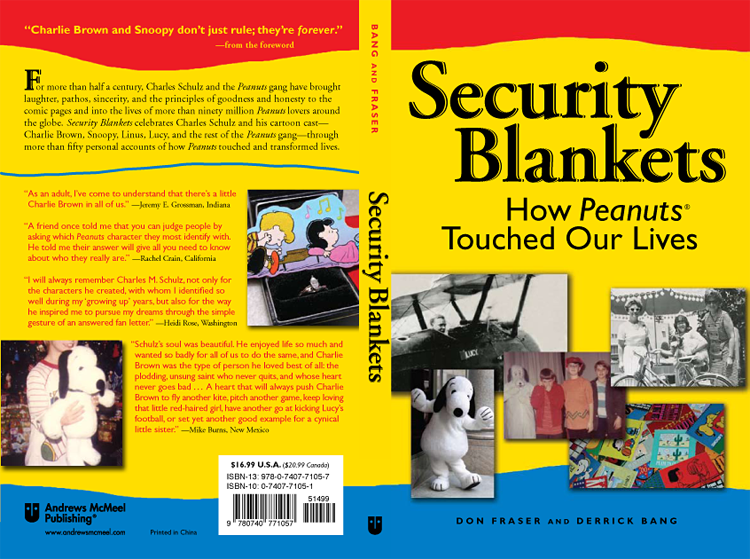 "Security Blankets: How Peanuts Touched Our Lives" a collection of heartwarming, poignant, uplifting and celebratory tales of how Schulz and his characters, Charlie Brown, Snoopy and all the rest have made an impact on us all was released in April 2009 by our publisher, Andrews McMeel Publishing, a long-time participant in the Peanuts franchise. See sample pages from our book and order on line at Amazon.com and Google Books.